This post is part of a three-post series for #CaliforniaWeekends, a trip sponsored in partnership with Starwood Hotels and Resorts. See disclosure at the bottom. 3:30 a.m. Surprise road trip kids! With bags packed and loaded in the car, we woke the kids and surprised them with, “We are going to Disneyland!” AND a Southern California road trip. They were up and dressed in a flash. We only wish they dressed this fast getting ready for school. 6:00 a.m. Wheels up SEA to LAX via Alaska Airlines! With no baby gear or stroller we carry on just four bags. Holy hell. This is amazing. 8:30 a.m. Arrive LAX. Get rental car. My kids choose the white Toyota Camry. Rolling! We will be shocked at how good of gas mileage this car gets. 10:30 a.m. We arrive at the Sheraton Park Anaheim Resort. Totally impressed with how they have thought of every detail to make a family stay more comfortable. Newly renovated, the rooms are spacious with balcony views of Disneyland Resort across the street. Connecting rooms allow us plenty of room to spread out and each have our own heavenly bed. 12:00 p.m. Hello Disneyland Resort! I’ve had a couple of recent visits on my own for work, but it is so great to be back as a family. I give the family a tour of all the new Buena Vista Street and we hit a few rides. 3:00 p.m. Mickey’s Magical Map Show. I was able to preview Mickey’s Magical Map during the launch earlier this summer, but watching my kids light up and sing along with the performance makes my heart sing with joy. Feeling so much Disney magic. 4:00 p.m. Back to Disney California Adventure Park. Hartzell family, meet Cars Land. Such amazing memories from my work for the launch of Cars Land with Expedia and I’m feeling butterflies in my stomach as I show them Luigi’s Flying Tires, Mater’s Junkyard Jamboree and the magestic mountains of Radiator Springs. We take a peek at wait times for Radiator Springs Racers. Yikes! Recommendation: Show up at 8:00 a.m. when the park opens and get Fast Passes for the whole family. Wait times averaged 80-120 minutes during our visit. 5:00 p.m. Back at the Sheraton Park Hotel for our afternoon break. We drove our rental car and parked. 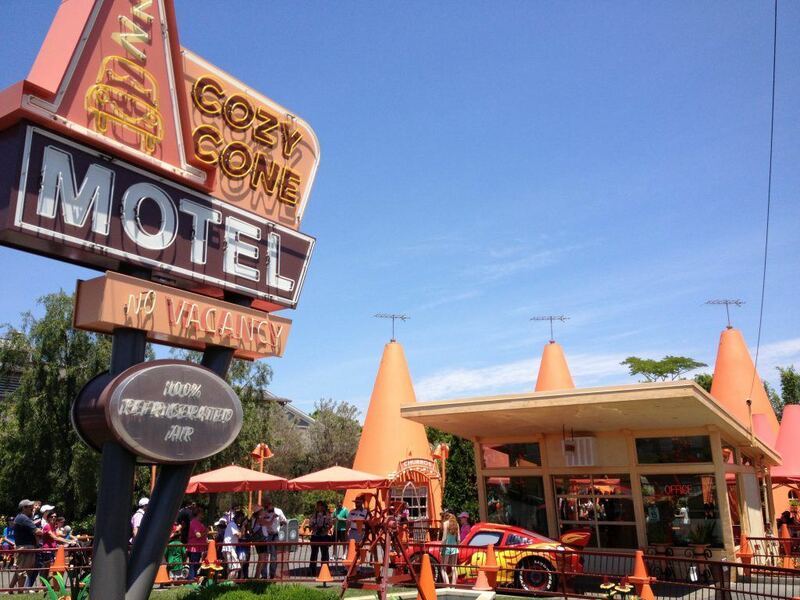 The hotel is within walking distance of Disneyland Resort, or a 5-10 minute drive. We are fans of staying at the Disneyland Resort hotels, so we can walk everywhere, however the rates during peak seasons can be outside the family budget. The Sheraton Park is a Disneyland Good Neighbor Hotel with all the perks of SPG membership and large, connecting rooms for families. Loved it. Rates at time of posting were $131/night for the Love Your Family package, where up to 2 kids eat free with purchases from the adult menu. The property sells Disneyland park-hopper tickets in the lobby, so you can skip the long lines at the ticket counter. 6:00 p.m. Downtown Disney dinner at Tortilla Joe’s. After an exhausting day in the park, Hip Travel Dad and Mama sip on some MUCH needed Margaritas, while we have table side guacamole and yummy Mexican food. Ahhhh…California I love you. 7:30 p.m. Back in Disneyland. My husband and 9 year old sprint to get in line for California Screamin’ before it closes for The World of Color show. We ride The Little Mermaid: Ariel’s Undersea Adventure. No line. Yay! Line looks quick at Toy Story Midway Mania. We all meet up there. Sweet shades! 9:30 p.m. Disney stimulation fatigue sets in. We are all exhausted after being up since 3:30am. We eat a churro. 10:30 p.m. My 5 year old melts down. One last ride and we choose Soarin’ over California. All four of us ride together. Awesome end to the night. Time for bed. We fall into our fluffy white comforters that my kids call “clouds” at the Sheraton Park Hotel, Anaheim. Until we meet again, Disneyland. Tomorrow, we will be refreshed and ready for you. But hurry the contest runs Agust 6th-13th, 2013. Must be 18 years old to enter. Official rules here. We’ve had so much fun putting together this #CaliforniaWeekends campaign in partnership with Starwood Hotels and Resorts. Stay tuned next post as we share more posts from our friends and fellow participating #CaliforniaWeekends bloggers. Disclosure: We received complimentary accommodations at the Sheraton Park Anaheim and have an ongoing consulting agreement with Starwood Hotels and Resorts. We were not required to express any opinions about our stay. As always, the opinions here are our own.